Bay Beans Lungo coffee capsules for Nespresso are a sweet, smooth, full bodied, medium to strong coffee capsule for Nespresso. A beautiful combination of coffee beans, sourced from some of the best coffee farms in the world. The coffee in these Bay Beans coffee capsule for Nespresso cost a little more, but the benefits are many with a blend of high quality coffee. 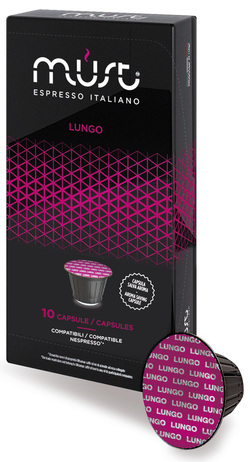 Buy Lungo coffee capsules. Amazing customer service & amazing coffee capsules! Thanks so much. We were looking for ages for organic, fair trade coffee in a capsule and water processed decaf and were so happy when we found this site. We will definitely order again.